Backdated Bento #51 – Not so healthy? I didn&apos;t really feel like bringing a bento tomorrow, but I had some food left over so I kicked myself to fix something anyway. Breakfast tier: Three Oatly mix pancakes (my boyfriend made those!) filled with kiwi and physalis; wheats for the soyghurt under the Pocky that I brought as snack. Vegetables of choice, e.g. green asparagus, zucchini, bell pepper, onion and mushrooms seems to work well. The asparagus taste combines really well with the lasagna! Preheat oven to 200-250 deg.C. Chop vegetables (finely, but not food processor grade fine). In a pan, fry the vegetables in some olive oil. Add salt, pepper and herbes de provence to taste. Add crushed tomatoes and cook for another minute. In another pan, prepare the bechamel sauce – heat butter and add the flour slowly so it does not clump, then gradually add milk until you get a nice, smooth white sauce. I usually put in a bay leaf and some pepper grains for additional taste. Oil the ovenfast pan and put two lasagna sheets next to each other on the bottom. Add a spoon of vegetable sauce, bechamel and grated cheese each. Top with a new layer of sheets and repeat until you reach the top of the pan. Fill up the sides with whatever is left of the sauce and top everything with cheese. Bake in oven until the lasagna sheets are cooked. Try to fend off orange cats and other hungry cohabitants. Also, I love physalis. They taste like wild strawberries from my grandma&apos;s garden! Backdated Bento #49 – Now with breakfast! I finally figured out that a small bento at 11 could impossibly last until half past five in the evening (at least; I like to work late because I get really productive in the late afternoon). Mainly, because I never eat breakfast. So I figured why not take two things in one and pack a breakfast layer? I&apos;ve seen people here do it, so it&apos;s not something unheard of. Top layer: Wholeweat fusilli pasta with blue cheese sauce and walnuts, decorated with basil and an apple sun. Lowest: Breakfast layer consisting of mango yoghurt, two ninja apple usagi, two small pieces of bread and a babybel cheese. Pasta with bluecheese sauce is another of those incredibly simple and tasty things to make. Simply crumble bluecheese, dissolve in some cream, add pepper, salt, and spices to taste, voilà! It works rather well together with wholewheat pasta, especially if you crumble additional bluecheese and walnuts on top. It&apos;s also good as a side dish to e.g. chicken, I hear. Backdated Bento #48 – Smile! Quick and simple leftover bento today (I try to make more food in the evenings to take the leftovers as bento). One from today, and one for tomorrow. 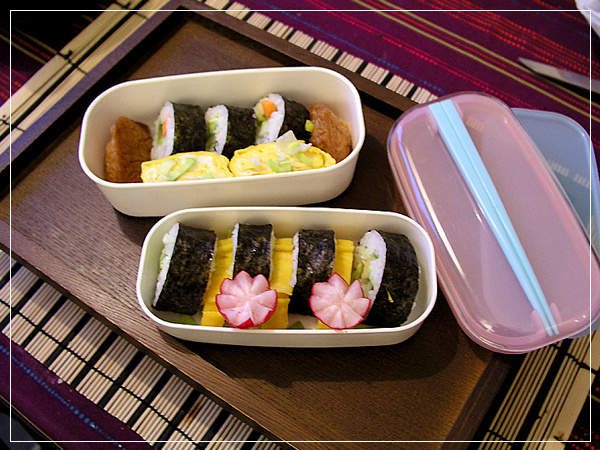 I really should prepare more the night before… making bento in the morning is a horror ._. Well, it’s not. It actually gets me to get up earlier and not after 10 snoozes of the alarm. But I’m usually late because I spend so much time arranging! This one is vegetarian. Not vegan, there is egg and mayonaise. * Two different vegetarian makirolls: Cucumber, avocado and carrot, and Cucumber, avocado, chopped leek and mayo. I was a bit afraid the carrot would be too dry but it got really nice and crunchy until lunch! * Two inarizushi corners (I saw them cut into cute little triangles at a restaurant this weekend and wanted to try it! It’s a bit if a waste though if you don’t make your own pockets, since the other half can’t be used as pouch anymore. Recipe: This is based on something you can make on a sailboat, so it&apos;s really simple! Chop onions, olives and some garlic, add a can of tuna, some fresh chopped tomatoes and a lot of italian herbs and pepper. Put them into an oiled, ovenfast dish and add cooked pasta, mix everything through very well, and add breadcrumbs to the whole mix. Make a thicker crumb crust on top, and also add some parmesan (maybe some flakes of butter if you’re worried about it getting too hot) and bake in the oven for a few minutes. Ultra-easy, but filling and tasty! * Upper tier (lower right): Carrot sticks, radish, avocado, cucumber sticks and a minitomato flower. Can you tell I had a lot of veggies left over from the morning&apos;s sushi? And a dash of mayo for dipping with an olive in it. 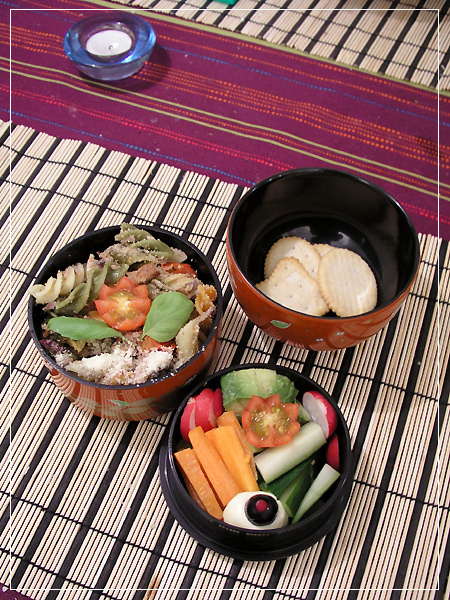 * Bowl: Crackers to go with the veggie snack. It never rains but it pours, they say… my second post today, with tomorrow&apos;s bento box. Big tier: Ruote pasta with vegetable sauce and parmesan. I love buying all sorts of odd pasta shapes! You can see the rest of the packet in the glass jar in the background, for a better look at those wagon-wheel pasta. Small tier: Radish, carrot flowers and tiiiiny cherry tomatoes. And another basil leaf. Bowl: A kiwi (can you tell I got a big tray of kiwis that needs to be eaten?) and a chocolate marzipan heart. I am always so worried about my boxes not having enough food to last me from 11 to 17:30, that&apos;s why my bentos are always stuffed! But every time I pack my Totoro bowl I find out that it holds a lot of food, in the end. This time I felt that if I filled all the top tier with dessert again I wouldn&apos;t be able to eat all of it… so I took veggies instead. I&apos;m probably gonna pack some dark bread to go with them and eat it as a snack. I think eating small snacks instead of one large meal also helps against feeling hungry, and is more healthy for the body, so I&apos;m gonna try this! Backdated Bento #44 – First bento of 2007! Big (right) tier: 4 Inarizushi, carrot flowers, leek and radish for the misosoup. And my meager excuse for a radish flower (they need to be soaked, and I didn&apos;t have the time for that). Small (left) tier: Kiwis on top of raspberry yoghurt. Not my prettiest or fastest bento ever, but I felt so bad not making a bento yet because I&apos;ve been on vacation until yesterday! I promise the picture quality will be better next time though. My cam&apos;s batteries were empty again.